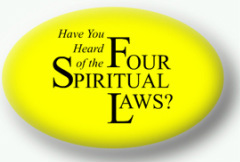 The Four Spiritual Laws is an evangelistic Christian tract created in 1952 by Bill Bright, founder of Campus Crusade for Christ. Bright wrote the booklet as a means to clearly explain the essentials of the Christian faith concerning salvation. God loves you and offers a wonderful plan for your life now and for eternity. 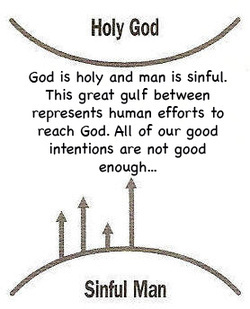 Man is sinful and separated from God. Therefore he/she cannot know and experience God’s love and plan for his/her life. Man is sinful. Man was created to have fellowship with God; but because of Adam and Eve’s own stubborn self-will, they chose to go their own independent way and fellowship with God was broken. Every human being is born with the same sinful, selfish, and self-willed nature.Man is separated. This means we were born NOT knowing God. We must individually Receive Jesus Christ as Savior and Lord, then we can know and experience God’s love and plan for our lives. When we receive Him, we experience the New Birth! Here is a message that most Christians do not understand about God's will. We have grown up in Church that has taught us to interpret God through our experiences. Often the argument presented is something along these lines, “Why do you believe that just look around you and you can see that isn’t the way it is.” As an example when it comes to healing, “If God wanted everyone healed then why didn’t this person or that person get healed?” We are coached and taught that our experiences outweigh the Word of God. The warning is this: Do not let what we do not understand (because of or through our experience) cause us to put away what we do understand in the Word of God. At no time should we let what we see, hear, feel, touch, taste in this world by our senses dominate what we actually believe. We are spirit beings born of the Spirit of God into a new kingdom that is not dominated by the flesh but lives according to the Word of God.